APPRISE researchers have presented research projects tackling gaps in the education of healthcare professionals in infection prevention and control. The presentations – including a limerick! – were at the Australasian College for Infection Prevention and Control 2018 Conference in Brisbane in November. Professor Lyn Gilbert spoke about how educating healthcare professionals to follow standard infection prevention and control strategies will help to recognise people carrying infections and keep hospitals safe from exotic infections, especially in travellers. Dr Mary Wyer’s showed how clinicians who watch videos of themselves communicating with people are able to better understand how they can improve patients’ understanding of infection risks and behaviours. This approach is known as a video-reflexive method. 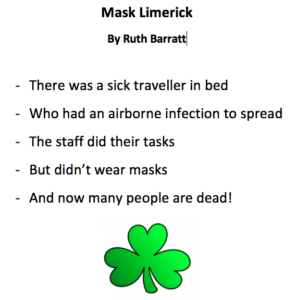 Ruth Barratt’s composed an original limerick as part of her three-minute presentation in a pop-up stage at the conference. She studies risk-taking behaviour of clinical staff towards routine use of protective masks for infectious diseases. To hear the latest research focussing on infection prevention and control, follow APPRISE on twitter, Facebook and LinkedIn or subscribe to our newsletter.